Self-honesty-check. How many books of “literary fiction,” have you read (or started to read) and you got fifty pages in and thought, “What is all the fuss about?” After all, this is a book that “everyone” is raving about. What’s wrong with me? Relax. It’s really not you. I promise. It’s them. Of course, this isn’t a new argument, but it’s one that’s not often heard or discussed in the mainstream media because they depend on the very publishers pushing the tripe. It’s also a round and round you go kind of thing because few people want to discuss, or sometimes even admit, that so much of what passes as “literary fiction” is junk. Many (most) of those that review books in the big press; The New York Times, Washington Post, NY Review of Books, etc., are afraid to admit that they dislike something that “everyone else” seems to like. Award winners? I usually chalk most of them up to bad writing = experimental writing = critics think it’s daring, bold = “literary” = awards = great reviews = book purchases = frustrated readers, many of whom are afraid to admit they didn’t “get it.” So, how is it, “Killing Reading?” Simple: The masses pick-up these books and don’t like them and they’re tricked one book after another. At some point, you lose interest, while the literary elite gush in their smugness of how the masses sometimes just aren’t quite “intellectual” enough to understand their haughty prose. 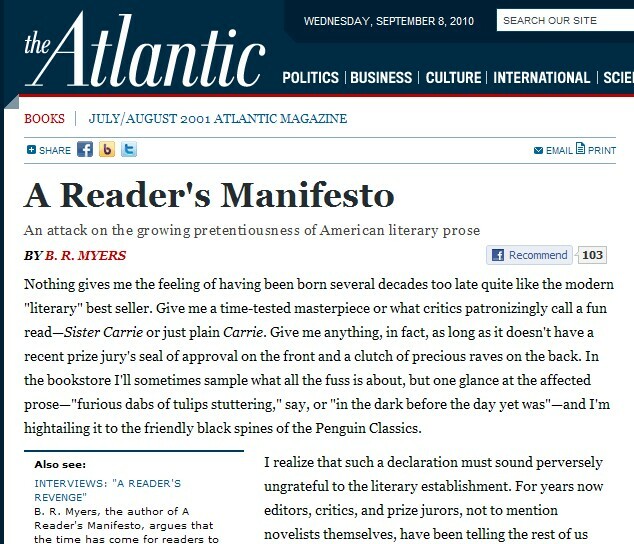 The Atlantic magazine had the guts to publish a provocative piece back in 2001 by B.R. 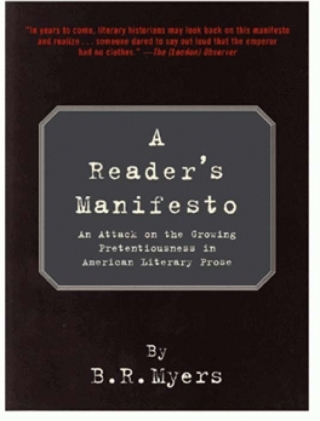 Myers titled, “A Reader’s Manifesto: An Attack on the Growing Pretentiousness of American Literary Prose.” Katy bar the door. It was like dropping a boulder in the middle of a quiet little pond. The ripples were far and wide — and mostly negative, of course. After all, the ones writing about the Myers article were the very people he was talking about! If you read a lot of book reviews in the big press you know that many of the reviewers are big-name authors themselves. The troops rallied. Myers was a heretic of the first order. But, you know what? Quietly, millions were thinking, “Finally! Sunshine lighting up the dreary, backscratching world of so-called ‘literary fiction. '” And millions of readers who despised so much of this claptrap felt vindicated. 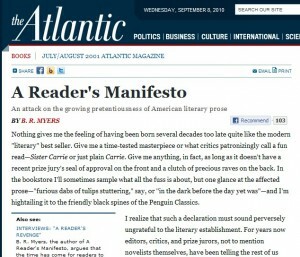 The article in The Atlantic was actually abridged from a self-published (surprise!) 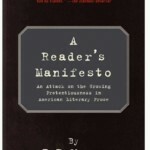 book written by Myers. Needless to say, after all the uproar, the full monty was released by Melville House under the same title as the essay, complete with a section where Myers takes time to methodically destroy rebut the critics of his magazine piece. I could go into actual writing samples/examples here, but Myers has done the job so well, I’ll let him have the stage. If you’ve ever picked up a book by Annie Proulix (one of among so many examples, we could fill this post with just the names) and thought, “???????? ?,” and felt you must not be quite “with it” in a literary sense, relax and enjoy.